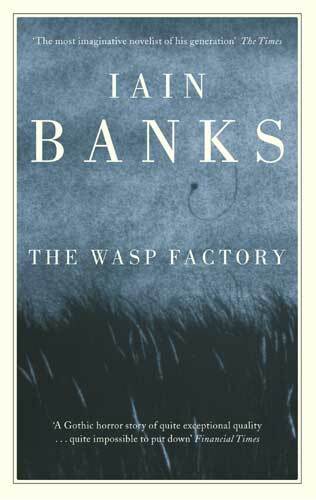 It is difficult to generically pigeonhole Iain Banks’ debut The Wasp Factory. Such labels as ‘horror’, ‘satire’ or ‘bildungsroman’ are inadequate and fail to appreciate the full extent of the novel’s dark aesthetic. It has even been slapped with the blanket identifier ‘Edinburgh Gothic’; a wholly naive and facile attempt to describe a disparate collection of Scottish writings. However, I’ve heard the less specific term ‘modern gothic’ bandied about a lot, and this falls somewhat close to the mark in describing the violent, gruesome and darkly comic story. The Wasp Factory seems to be a blatant and total attack upon a romanticised artistic vision of Scotland (see: Waverly by Walter Scott for the progenitor of romantic Scotland in fiction). The novel’s narrator is Frank, a sixteen-year-old serial killer who lives alone with his father on a remote island off the Scottish coast. Perhaps in an attempt to extricate himself from a national romantic cliché, Banks makes Frank construct, in miniature, tranquil scenes representing an idealised, peaceful Scotland, and then destroy them with controlled floods and explosions. Frank is king on his island and, without remorse, tortures animals, murders children and engages in quasi-religious, perversely ritualistic activities with the ‘wasp factory’; a torturous contraption he has constructed to guide him through life. Frank’s naivety and dependency upon a ritualistic lifestyle contrasts severely with his acts of violence and mutilation; so I think he fits well into the Gothic characterology, in which perilous innocence and demonic power are frequently drawn together. Frank is a murderer, but dismisses his horrific acts with adolescent indifference. The novel lacks any traditional ‘plot’ and is difficult to describe without giving something away; suffice to say it’s a story of a twisted and perverse boy whose narration is as gruesomely detailed as it is comically evoking. Yet Frank is an imperfect protagonist; he is frequently too self-aware to protect himself with pleas of naivety, and the manner in which he describes his schemes demonstrates a level of contrivance not conducive to the presentation of a confused individual. This entry was posted in Novels, Reviews and tagged Iain Banks, The Wasp Factory. Bookmark the permalink.